The Monuments Men, directed by George Clooney, is a smoothly executed, poorly written, true story about a group of men in WWII who rescue stolen art from the Nazis. With stars like George Clooney, Matt Damon, Bill Murray, Cate Blanchett and John Goodman, I had high expectations of this film. Unfortunately, The Monuments Men failed to deliver, falling into the trap of many other Hollywood films, (Unbroken, I’m looking at you) where the big budget and “look” of the film, drowns out the actual content. 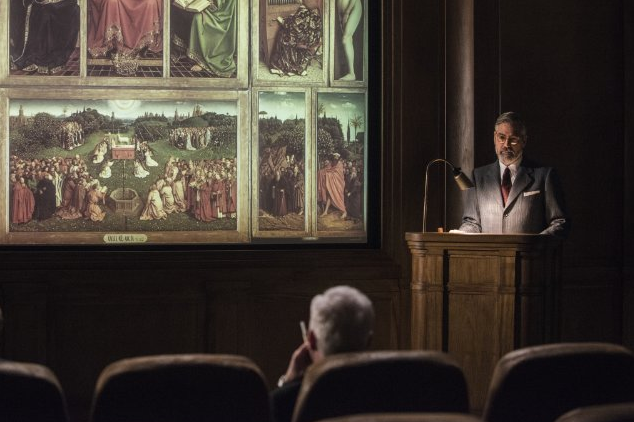 Basically, George Clooney leads a gang of (all male) museum directors, curators, and art historians, across enemy lines in WWII, to save the artistic masterpieces of the 20th century. Similar to Clooney and Damon’s previous film trilogy, Ocean’s Eleven, There is limited character information given about these men- they simply waltz on screen with a paintbrush in one hand and an ill-fitted army helmet in the other. Over the course of the film, these men flit across Europe, saving art and cracking jokes. A few die on the way, but we barely know enough about the characters to feel any strong emotion. Contrary to feeling sympathetic towards their deaths, I was often excited as another death meant I was closer to the end of this movie. In an interview with Clooney, he states that ” We didn’t want it to be a civics lesson… we wanted it to be a “buddy” movie”. In any other context, he may have succeeded. Unfortunately seven grown men cracking jokes and having fun seemed a bit incongruous in a film based around an event that killed more than 60 million people. In terms of the relationships between characters, the film reminded me of the “boy’s road trip” genre featuring films like Last Vegas and The Hangover. However that genre is definitely better suited to the casinos of Las Vegas rather than the mines of war-torn Europe. As previously stated, the film spends more time on witty one-liners than character development. The tragic death of Donald Jeffries (Hugh Bonneville) followed by a heartbreaking voice-overed letter to his father would have been more depressing had we actually known anything about him. The only interesting plot line comes from the haughty Claire Simone (Cate Blanchett) a passionate art curator forced to work with Matt Damon to get the paintings back. Although the budding romance between Damon and Blanchett fizzles out, her sassy personality and hate of the Nazi’s keep the audience more interested than the other storylines. The film is gaggingly patriotic, filled with noble intentions of “Salvaging Culture” and “Saving a Civilisation’s History”. However despite the film being about “Saving Art” the only justification of these actions is given by Clooney’s scholarly oration to the American president.The closest the film gets to discussing the personal, emotional and spiritual importance of art is the multiple panning shots of burnt masterpieces accompanied by sad music. It sort of felt like; “The Church owns this sculpture, and our friend died for it, so we need to get it back”- More of a film about pursuing justice for the art owners than saving culture. Preston Savitz: You’re just going to sit down? Richard Campbell: Yeah, I think – why don’t we all just sit down for a sec. Okay. Preston Savitz: I don’t smoke. Richard Campbell: Take a cigarette. Preston Savitz: I don’t smoke! Richard Campbell: Take a goddamn cigarette. Clooney’s performance in this was bland. I have recently come to the realisation that he plays the same role in all of his movies. I’m not disputing his talent- I really like him as an actor. However in Gravity, The Descendants, Fantastic Mr Fox, Oceans 11/12/13, and The Monuments Men, he plays the exact same character; The passionate, charismatic l eader who organises the operation and motivates the team. Now that’s not a bad thing, many actor have their niche- Bill Murray is the eccentric old man, Rachel McAdams is the female love interest and George Clooney is the reliable commander. [Occasionally actors break out of their typecasted characters, and either fail dismally or produce a shocking edgy film that challenged the viewers (Think Steve Carell in Foxcatcher)] Despite this, it would be nice to see some variety in his performances, especially as he is often the lead role. It seems that Clooney invested most of his time and 70-million-dollar-budget into nice cinematography and impressive sets, rather than focusing on the root of the story- the script. The music is boisterous, cheerful and irritatingly patriotic, going to great lengths to glorify America’s effort in the war. 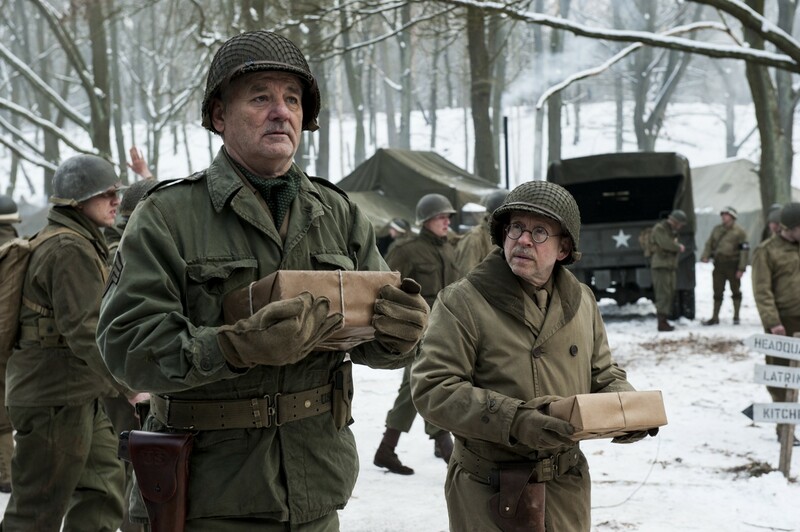 Ultimately, The Monuments Men, is a nicely made and poorly composed modern heist comedy in a WWII setting. Overall, it has The Hollywood Shine, but lacks any genuine storyline.